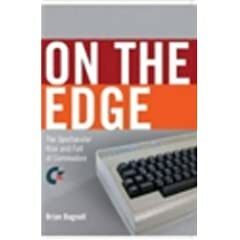 Just got done reading "On The Edge: The Spectacular Rise and Fall of Commodore", by Brian Bagnall. As someone who grew up right outside Commodore headquarters and learned to write code for both the C64 and Amiga computers, it brought back a lot of memories. If you ever read a copy of COMPUTE!, played a game by Epyx, or experienced a Guru Meditation Error, you'll get a kick out of this book. The book paints a detailed picture of the various eras of Commodore technology, but it also provides compelling portraits of the engineers and executives responsible for Commodore's successes and missteps. You can really feel for the engineers who invested so much of their lives into the company with seemingly so little in return. Some interesting factoids are revealed as well. The stories behind why C64 games took so long to load, how the Amiga chips got their names, and why so many Commodore computers were DOA are all covered in the book. 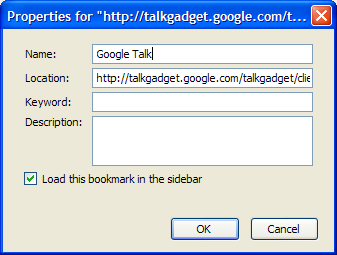 Bookmarklet: Drag Google Talk to your Bookmarks Bar for 1-click access to a floating version of Google Talk. Hit OK, click the bookmark, and it will open in Firefox's sidebar panel. Netvibes: Check it out in your Netvibes Homepage. Today, we're releasing the Google Talk Gadget - a embeddable component that provides a rich IM experience anywhere on the web! It's Flash-based, so it's nice and snappy, requires no download, and works anywhere Flash 8 is supported, including Mac OS X and Linux. It's got the same look and feel as the downloadable Google Talk client, along with some cool new features, including integration with YouTube and Picasa - if you add a video as your status message, your friends can watch the video directly from Google Talk! See it in action, or check it out in this YouTube video. If you're using the Google Personalized homepage, you can add the gadget to your page. Or, if you'd like to add it to your own page, learn how here. More coverage on the Google Talk Blog and Official Google Blog. There was no consistent pattern of disk failure associated with high temperature or increased disk activity. Some SMART error signals are well-correlated with impending drive failure, including scan errors, reallocation errors, and probational counts; drives that reported a scan error were 39 times more likely to fail within 60 days. However, other SMART error signals have only weak correlations with failure, namely seek errors and CRC errors; over 72% of all drives reported at least one seek error. A majority of the failed drives (56%) reported none of the aforementioned well-correlated errors, and a large fraction (36%) reported no SMART errors whatsoever. As someone who has had a few drives go bad over the years, I found this very interesting. My key takeaway: certain SMART error signals (not all) serve as a valuable warning, but you can't count on SMART to tell you when your drive is about to fail. Lots more data and details in the full paper. Haven't had a post for the past two weeks - like some other Googlers, I've been pretty busy lately. Reminds me of a joke I heard before joining Google: "Your 20% time? That's hours 80 to 100 in the workweek". Fortunately, it's not quite as bad as that. I've got a number of (hopefully interesting) posts queued up which I'll be putting up this week.